San Francisco is my first in a series of themes on place. I didn’t choose this city because I live here and love it. Not entirely. I picked it because I know it. I will need help when I feature Cuba. I will need a larger, more distributed community when I tackle beyond-the-stereotypes Detroit. Even for New York or Paris, I will need help from someone who understands the backstreets and can read between the lines. But San Francisco I can feature now, and with any luck, I can show how a place can be relevant even if you don’t live there, haven’t been, or don’t like it. Cities have durable personalities that radiate through the veils of different light and different eyes. 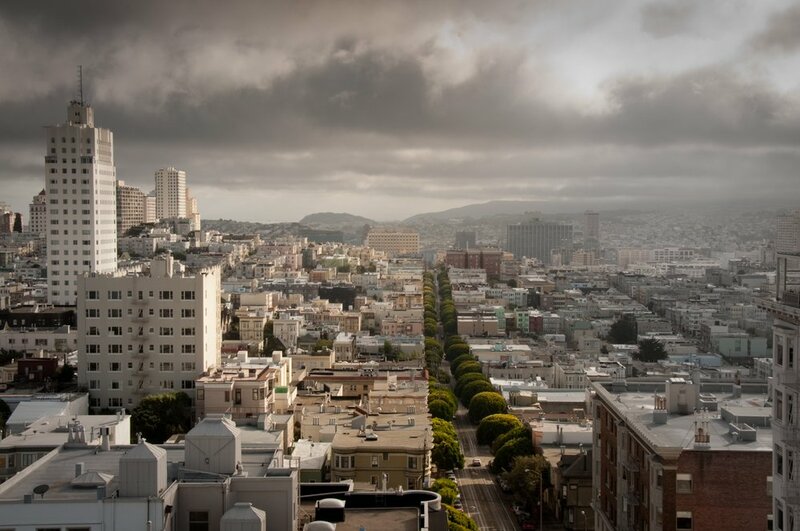 I’ve scattered in quotes about San Francisco’s character from Pictory members and famous figures, and at the end of this showcase you’ll find another kind of portrait of the city by the bay. Here’s to the first of many features on place. I hope it makes you think again — or take a new photograph, or tell a new story — about where you live. 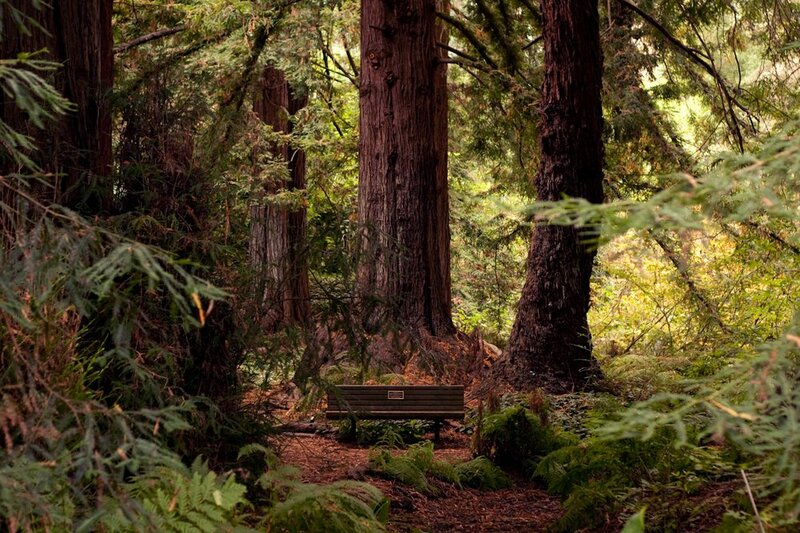 For as long as I’ve known about the redwoods, I’ve wanted to see them. I remember the encyclopedia showing giant stumps with archways big enough to drive through, and a tree trunk so enormous it took 20 people to surround it hand-in-hand. During my last trip to San Francisco I finally saw the red giants — not just one but a whole microforest of them — in the botanical gardens of Golden Gate Park. As I sat down in the midst of them, I reflected on the supportive climate of San Francisco; a city whose residents and policy makers seem to respect the natural beauty of the region. This image was taken with a Canon EOS 40D. Paul is a photographer and designer in Chicago. 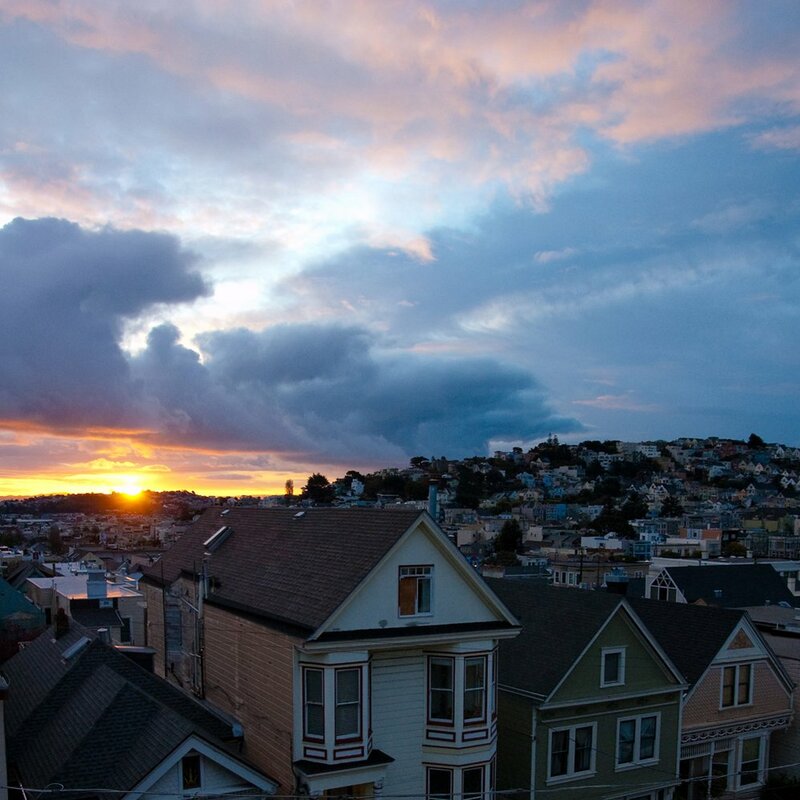 A great city has great vistas and San Francisco is full of them. At its geographic center, the hills of Twin Peaks rise up nearly a thousand feet above sea level. The summit marks the boundary of two microclimates: from the west, blankets of fog roll off the ocean until they hit this barrier of land, while to the east sun and warmth preside across the city and the bay. This image was taken with a Nikon D70. Naz Hamid is designer and principal of Weightshift, a design studio in San Francisco. 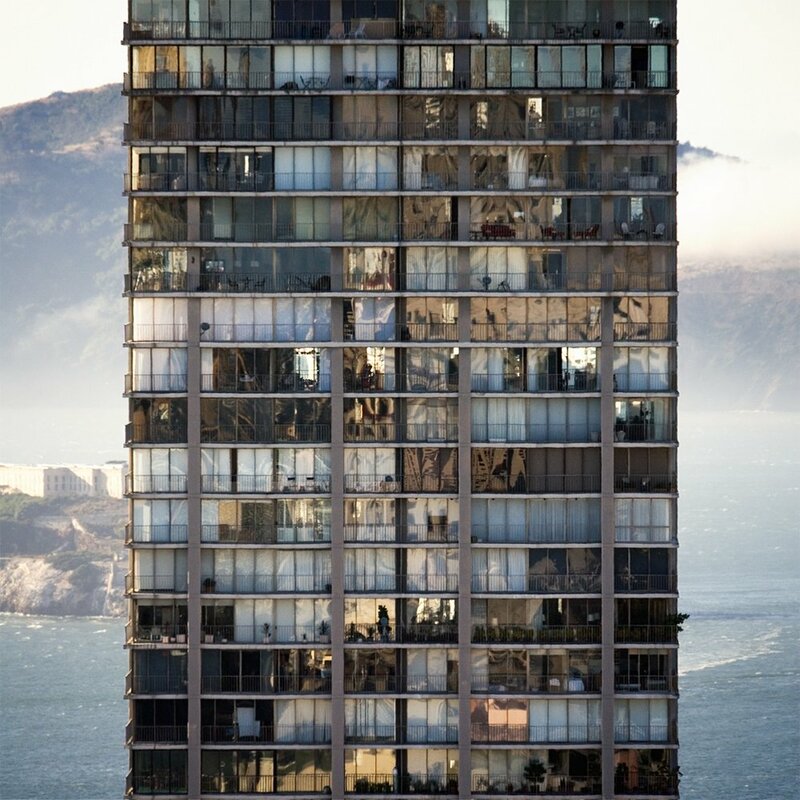 As a construction photographer in San Francisco, I get to see angles of the city most people don’t. The Bay Area is becoming a hub for medical research and a booming technology sector, creating a need for buildings like this one on the UCSF Mission Bay campus. Balanced on a crane over the newly framed tower, ironworkers Dan Ladipow, Virgil Brosseau, Ken Souza, and Jeff Ramage string cables back and forth. This image was taken with a Nikon F5. William Cendak II is a construction photographer in San Francisco. On the day I moved to San Francisco in 1996, a friend and I drove a rental car around and over the steep streets like Bullitt. Even after a decade in the city, I never got over the city’s wild topography. From my tiny apartment in Potrero Hill the landscape cascaded into downtown toward the Bay Bridge. I’d watch skaters bombing down Rhode Island Street with no gear. Toward the end of my time in SF, I visited a friend’s apartment on Russian Hill. From his window I caught this view of the Eichler Summit, with Alcatraz and the mountains of Marin in the background. Though just a few blocks away, the top of the 32-story building was almost eye level with the 8-story building where I stood, so steep was the short distance in between. This image was taken with a Canon EOS 5D. I’m a designer, photographer, and filmmaker currently living in Brooklyn. San Francisco is a place where things are constantly happening. Morning to night, the city is abuzz with activity and culture. 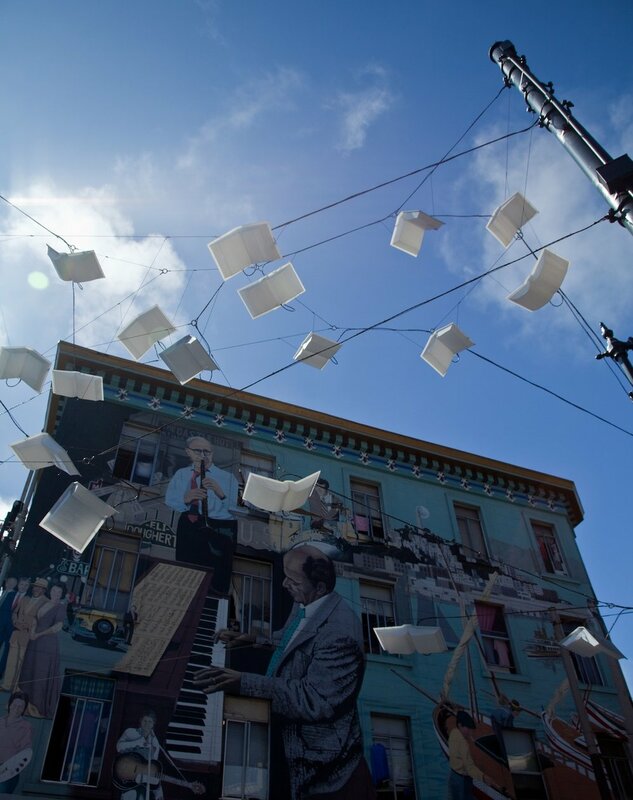 This mural of famous jazz musicians, political figures, and writers sits on the boundary of Chinatown and North Beach, the historic Italian neighborhood. I love the bird sculpture that reaches out over the street from the legendary beat era bookstore City Lights, implying the migration of ideas. This image was taken with a Canon EOS 5D Mark II. Dana Curran lives in Columbus, Ohio. In San Francisco, the art of seeing is easy to practice. It has something to do with that western light. Instead of “Golden Hour,” there are golden days. I sometimes wonder if the locals are haunted by the fact that they cannot always stop their busy lives in order to appropriately deal with the constant, quiet extraordinary. Or worse, if it loses its power over time. Unlike any city I have seen, the place breathes with a tone poem that is best encountered foot to earth and barely moving. This image was taken with a Canon PowerShot Pro1. Not everything in San Francisco is beautiful. But this scene, on an unseasonably warm day, was just about perfect. It epitomized West Coast easy living. Everybody in their right place. 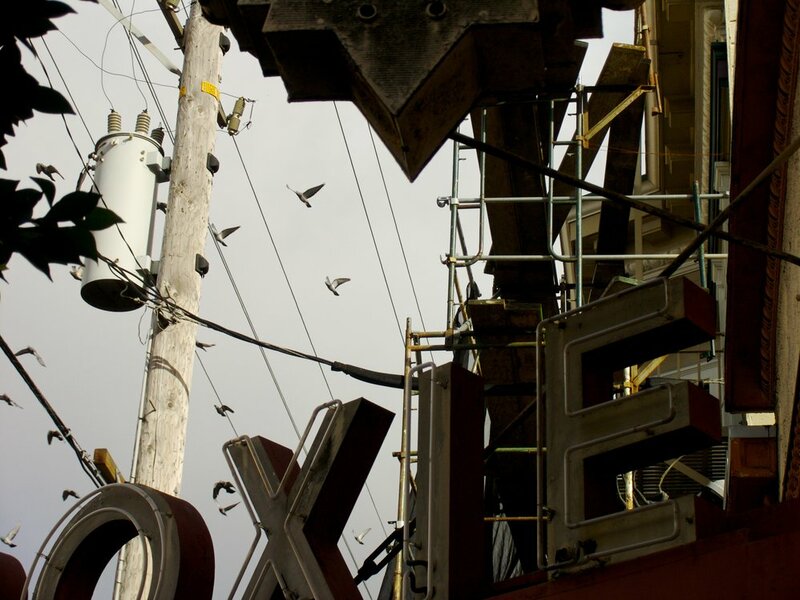 Jennifer Wetzel is a photographer living in Kansas City, Missouri. She is also the photo editor for KCFreePress.com. Aircraft carriers were once a common sight along the waterways beneath Golden Gate Bridge. For more than a century, the Bay Area was ringed by a handful of large Navy bases and shipyards that together served to shelter and repair a significant chunk of America’s Pacific Fleet. The last of those bases closed during the 1990s, however, and with them the Navy’s presence in the region all but disappeared. 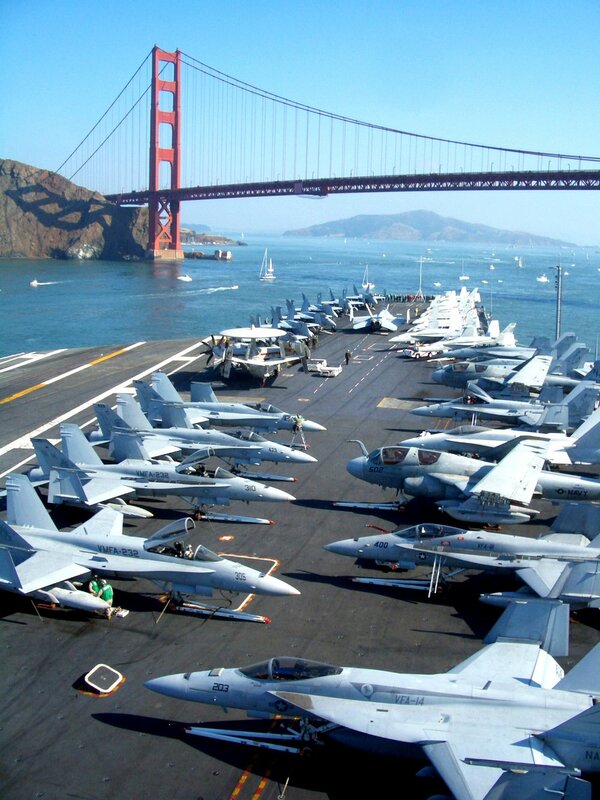 In 2006, however, the USS Nimitz paid a rare visit to San Francisco as part of the city’s annual Fleet Week festival, and I managed to arrange a visit to the ship as it sailed into town. A cruise under the Golden Gate Bridge is always memorable, but to see it from the perspective of a flight deck lined with Navy warplanes was a very unique way to recall the city’s nautical history. This image was taken with a Casio Exilim EX-Z40. Todd Lappin is a media product strategist and the founder of Telstar Logistics, a leading provider of integrated services via land, air, sea, and space. San Francisco brings a new point of view on almost everything: cuisine, culture, politics, art, weather, zeitgeist, spirit, sport, attitude, sexuality, vision, and nature. Live here and you can breathe in perspective daily, if you make the effort to explore. This image was taken with a Canon Powershot SD300. I use cameras and a computer to capture, create, and manipulate images for a paraglider company. I reside wherever my glider, laptop, and cameras happen to be. San Francisco has a special relationship with the sun. In the morning, it flirts with the city, burning off fog, warming up rooftops, and setting the hilltops on fire. At dusk, the sun leaves the city like a fond lover, unable to let go until the very last second, as it slips into a bank of earthbound clouds or, on a clear day, over the edge of the Pacific horizon. I am a man with two feet in eight worlds. A born wanderer trying to put down roots. Comfortable most anywhere, which can be the problem sometimes. I’d heard about San Francisco my whole life, but had never been west of Texas until this fall. I had some nebulous and inconsistent ideas about the sort of city it was (hills, earthquakes, tech companies), but on arrival found something more diverse and complicated. Turns out, I’d neglected to consider what a creative place it is. I’m a fan of the Beats (particularly the poet and novelist Richard Brautigan), and San Francisco preserves their art as a cultural legacy more than I’d expected. 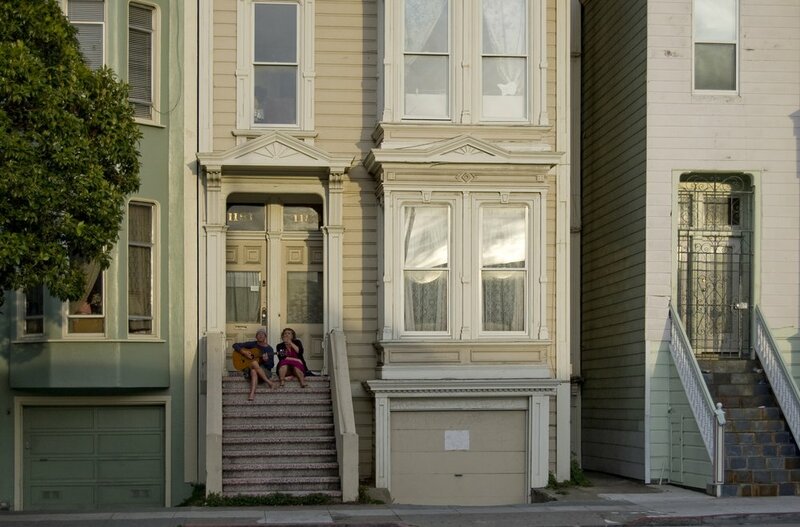 The act of everyday creativity shown here — making music on the steps — delighted me. I imagine the pair as present-day versions of characters from Brautigan’s Trout Fishing in America, preserved in their apartment as the rest of the city changes and grows. This image was taken with a Nikon D40. I live in and love Chicago, where I work for a nonprofit, take pictures, knit, and get awesome. While driving down Market Street, I spotted this guy among the shoppers. I’m not sure if he was a bike messenger who needed a rest or a street kid who’d passed out, but in either case he represented a thriving San Francisco bike culture. This image was taken with a Konica Minolta Dimage A200. Amy Seidenwurm likes to take pictures and keep bees. During my most recent visit, I decided it was time to see another side of San Francisco. Nostalgic for a summer spent in Central America, I pounded the sidewalks of the Mission, getting a feel for the city’s Latin street culture. I arrived with a vision of the Golden Gate Bridge, hilly streets, and the Transamerica Pyramid in my mind, and left with the taste of carnitas and horchata in my mouth. This image was taken with a Canon PowerShot A590IS. Freelance web developer/designer and photographer currently grimacing his way through the bleak greyness of the British winter. 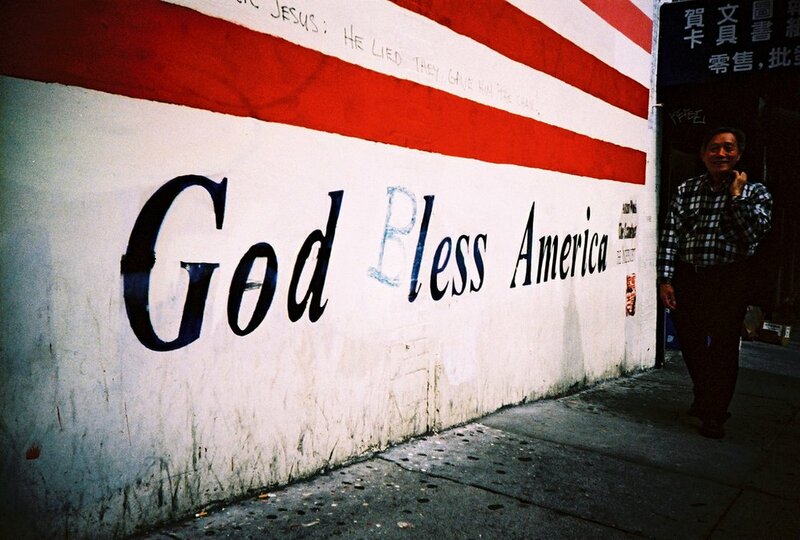 In San Francisco’s Chinatown there is an American flag painted on the side of a building as a memorial to 9/11. It gets graffitied and repainted so regularly that the wall has become a patchwork of reds and whites, the message never the same. I wish I could photograph it every day. This image was taken with a Lomography L-CA+. Kevin Meredith is a photographer, writer, and teacher in Brighton, England. 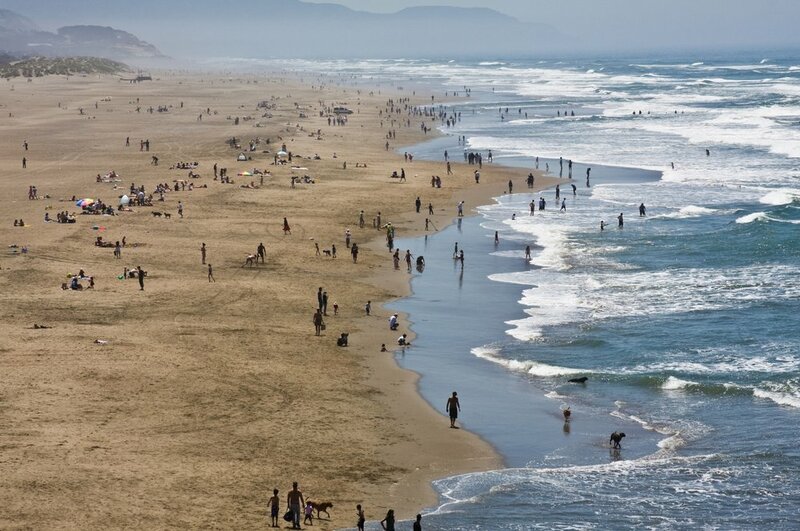 A 75-degree day brought the crowds to a popular San Francisco sunbathing spot, Dolores Park. There must have been 1000 people drinking wine, chatting with friends, and blasting music. This pair, seemingly oblivious to the crowd and noise around them, lay quietly in the grass. At first I thought they were dreaming of somewhere far away, but they were probably just enjoying the moment: partaking in the sound of laughter, conversation, and song — the cadence of the city. This image was taken with a Nikon D50. Brooke lives in Austin and makes homes. I was walking downtown along Sutter street when I noticed this trolley car. 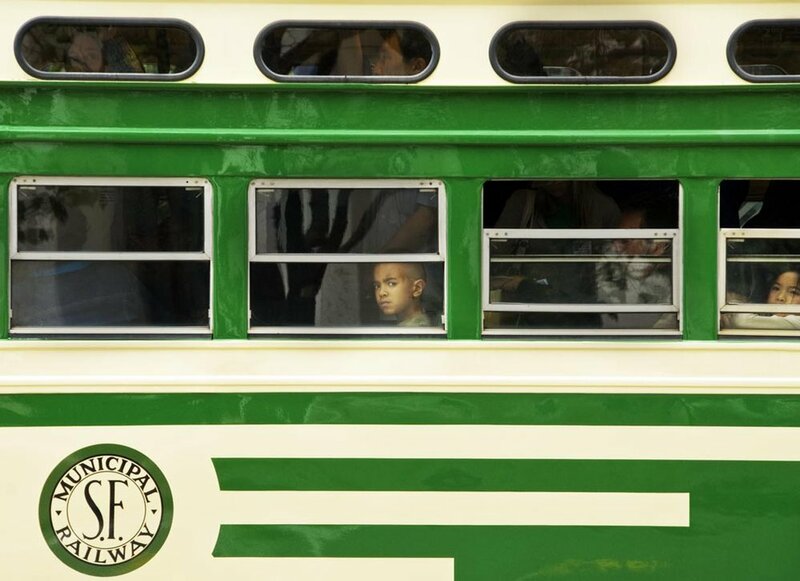 While the locals may take their urban transportation for granted, I found the trains, trams, and railways of San Francisco very special, and not just because of the engaged faces that peered out at me. This image was taken with a Nikon D200. “mOetwain” is the shutter name of Owen Tiam, a Beijing-based photographer. Looking south down Hyde Street from a balcony in Russian Hill, I thought of all the people drawn to this beautiful city from afar for its promise. Not everyone finds the reality as perfect as their vision. Just like in any city, there’s no shortage of melancholy, unrealized dreams, lost fortunes, and lives ending too soon. But in San Francisco there’s also a persistent optimism that stands out even in the midst of hard times. New things are always being created here. This image was taken with a Nikon D90. I try to take my camera everywhere with me so that I’ll be ready when unicorns crapping rainbows come flying in from the heavens. 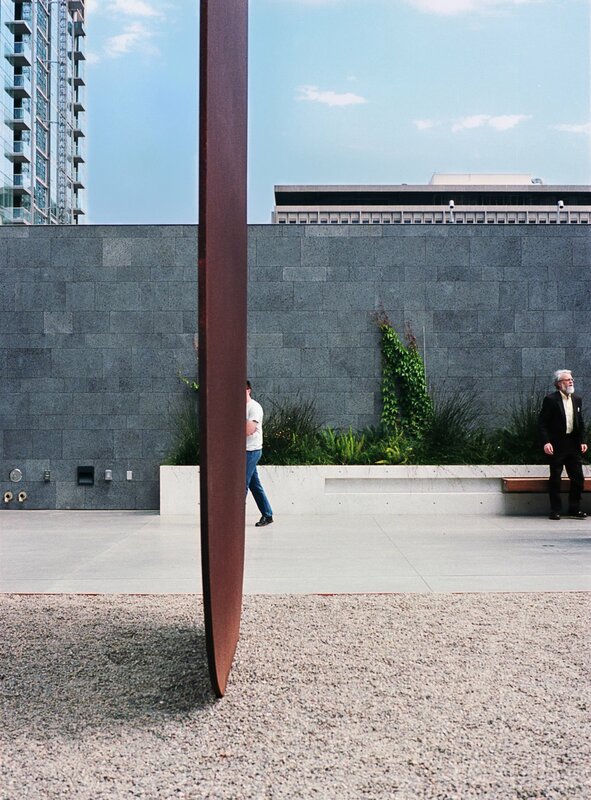 This rooftop sculpture garden (at the SFMOMA) is not an isolated enclave. Its clean lines and smooth spaces open out toward the surrounding skyline and mesh almost seamlessly with it. This tidy and intently designed part of the city is one of several conflicting images of San Francisco. It’s what much of the city would choose to be if it could. But at ground level — where those same lines, forms, and excesses of design are also in evidence — there are no blue-blazered guardians of order to keep it clean. This image was taken with a Voigtlander Bessa-R.
Nick lives in Berkeley and is a small cog in a bureaucratic machine during working hours. Otherwise, a guy with a camera. 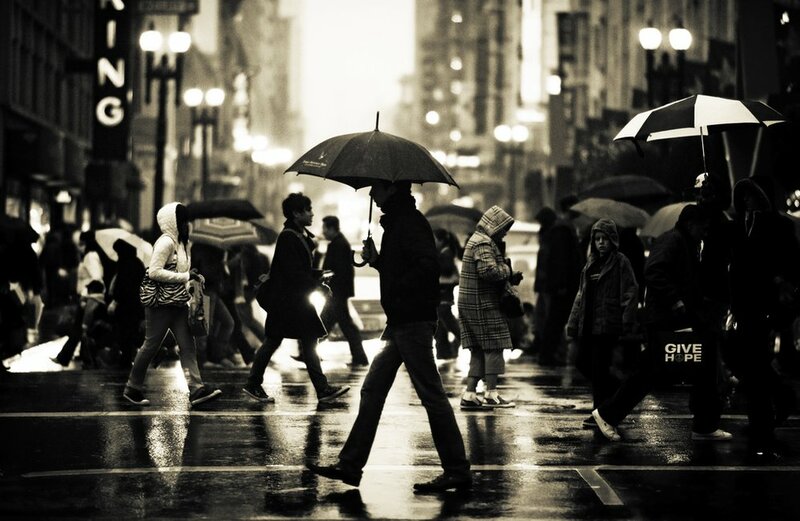 With the winter months comes the rainy season in San Francisco. Last minute holiday shoppers brave the “harsh winter weather” (40 degrees with rain) to run errands in Union Square. This image was taken with a Nikon D700. I’m a professional photographer and web designer currently living in San Francisco. Photography is more than my passion and a means of expression; I also see it as a meaning to my life. San Francisco is a city of passionate people. 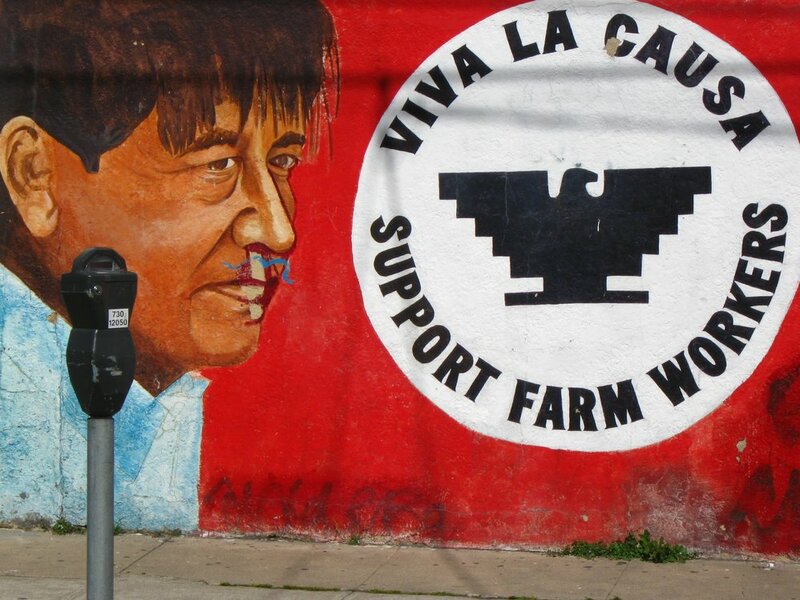 They are passionate not only in their celebration of life — which is evident in the many street festivals that occur year-round — but also in their fight for social justice. 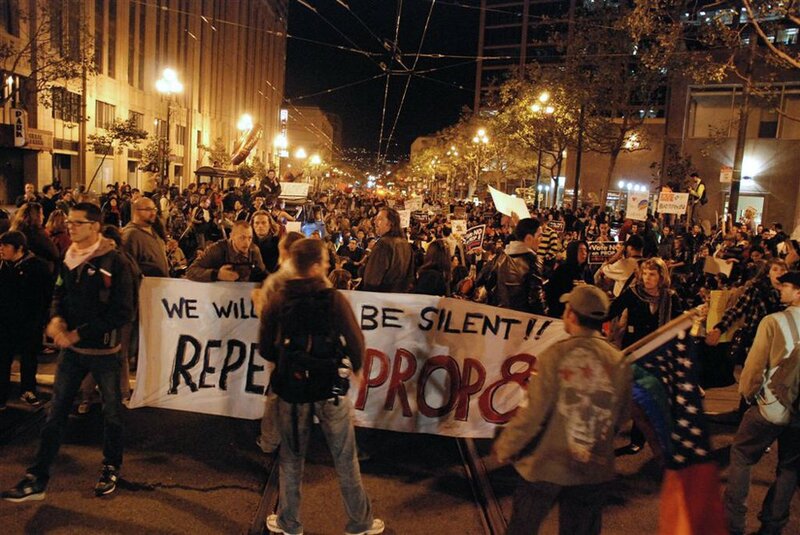 On November 7th, 2008, three days after the election of President Obama, San Francisco citizens took to the streets to protest the passing of Proposition 8, which banned gay marriage in California. An electric feeling charged the air as the marchers circled back to block Market Street downtown for three hours. This image was taken with a Nikon D80. I am an administrative professional, independent photographer, and communication ethicist living in Chicago. San Francisco fits many people and cultures within a 7-by-7-mile boundary, and sometimes the combination of old and new can be awkward. 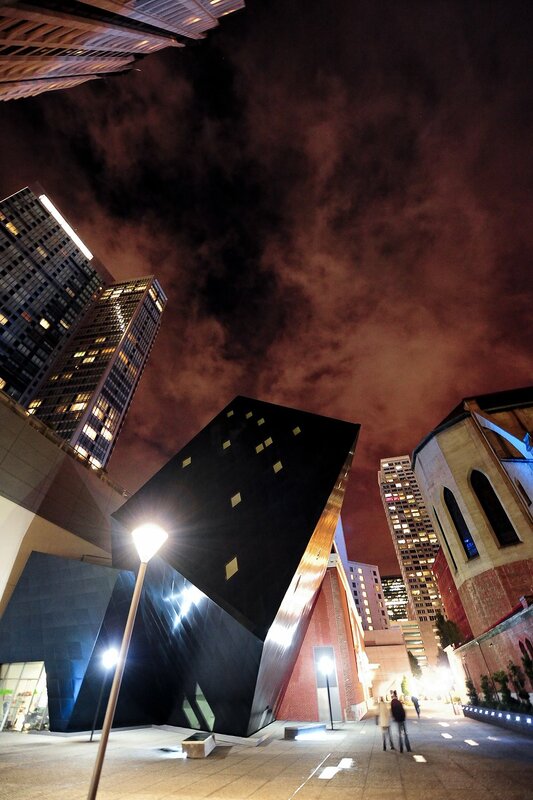 The recently completed Contemporary Jewish Museum is squeezed between the old St. Patrick Catholic Church and the towering skyscrapers of the Financial District. This image was taken with a Nikon D3. By day, I am an engineer at Twitter. By (every) night, I am a photographer. Not quite a big city, but not quite a small town. 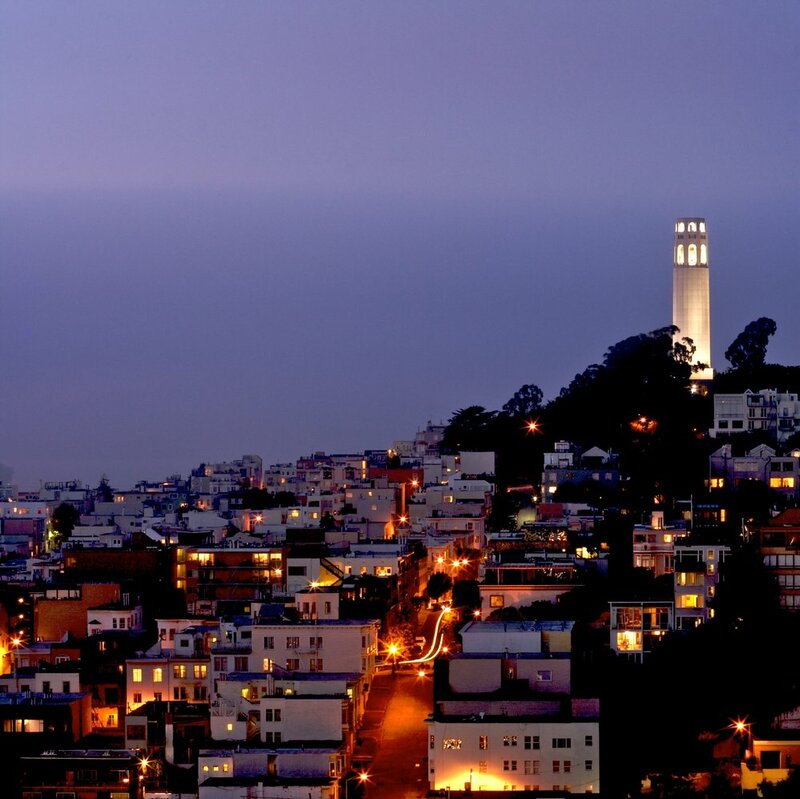 San Francisco can be a beautiful place, especially as the day transitions to night and a backdrop of fog over the bay highlights Coit Tower. This image was taken with a Canon Digital Rebel XTi. I’m a senior software engineer working in San Francisco. When I’m not behind a keyboard, I’m behind a lens shooting everything interesting around me. I’m pulled to San Francisco when I need the intimacy that Los Angeles doesn’t have. 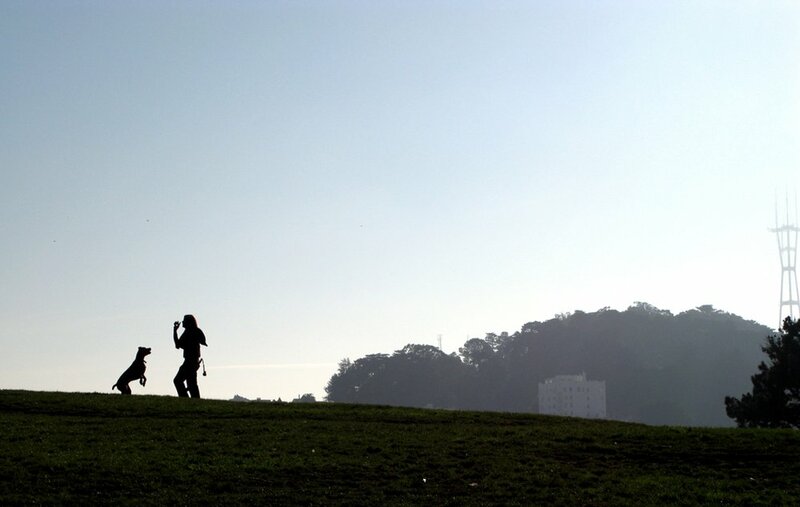 From Alamo Square I can see urban beauty in any direction — as far off as Sutro Tower and as close as the park at my feet. This image was taken with a Canon PowerShot G9. Alexandra Pia lives in Hollywood and works in the tv and film biz. She helps to get creativity in one ear and out the other. She needs plenty of natural light and green foods, so she will be planted in the West Coast for life. 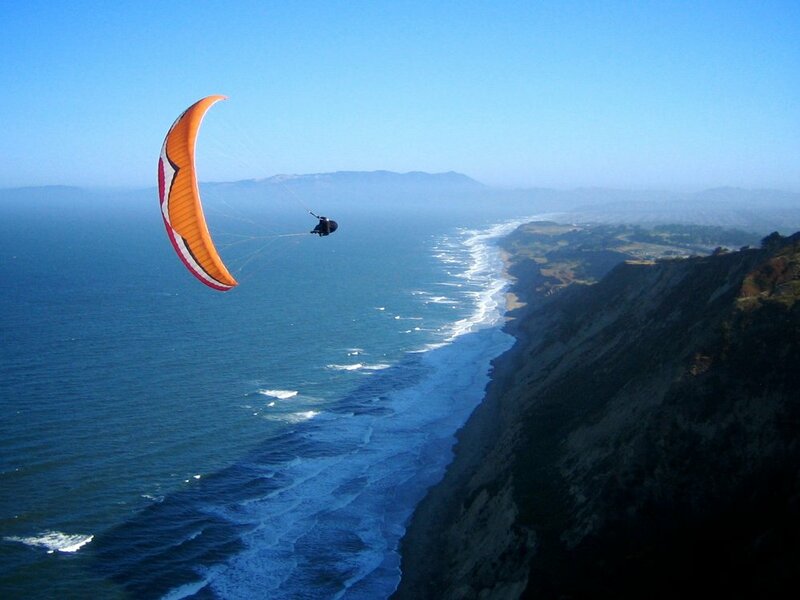 I love the many spots around San Francisco where you can climb to a higher altitude and clear your head from the stress and noise of the city. 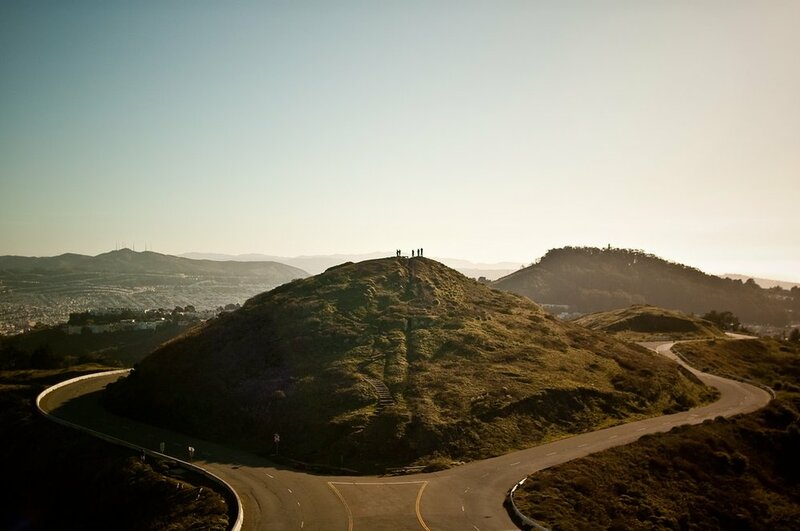 Two of my favorites are Bernal Heights and Twin Peaks, shown here. If you sit on top of the stone barrier designed to keep tourists safe, you can feel completely alone and peaceful — like a bird flying in the breeze. I’m a designer, photographer, and music producer living in San Francisco for the last 10 years. What is the language we use when we talk about San Francisco? To find out, we collected every written submission to the San Francisco Pictory theme and broke down how often certain terms were used. Below you’ll find 100 of the most common descriptive words used, and the number of times we spotted them.